You will love this sweet Brown Sugar Bear! 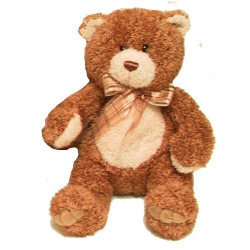 With rich brown coloring, contrasting fur inside the ears and on the snout and belly and paws, and a wonderful sheer ribbon, this bear is great to look at...and even better to hug and squeeze with a super soft body. And those cute sculpted feet and toes...so cute! Brown Sugar Bear measures about 13 inches of Hugging Buddy Bear!